Foytack was a consummate team player. He was always willing to pitch an inning or make a start for his team in an era when starters were routinely used in relief and pitch counts were nonexistent. Foytack was essentially a career .500 pitcher over 11 big-league seasons, with an 86-87 record. However, a closer look at his career reveals that between 1956 and 1959 he was one of the top ten hurlers in the American League and ranked fifth in total wins.2 During this period, he ranked in the top ten at least twice in wins, strikeouts, complete games, hits per innings pitched, games started and complete games. One of his childhood heroes was Detroit Tigers’ Hall of Famer pitcher Hal Newhouser. 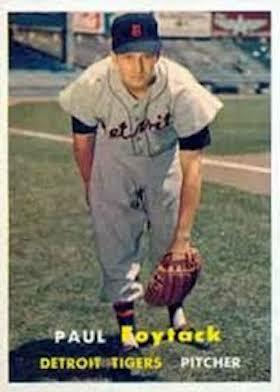 Upon graduation in 1949, attracted to Newhouser’s Tigers, Foytack was signed as a free agent by Ed Katalinas. In 1951 Paul started the season with Class A Williamsport, where he played against his hometown Scranton Miners. In Foytack’s first appearance in Scranton he lasted less than three innings in an eventual 18-1 loss.6 However, on July 2, he redeemed himself when he fanned 12 in 12 innings, gaining a victory over Scranton.7 After posting a 7-9 record in Williamsport, Paul was promoted to AAA Toledo, where he finished 3-5 but with an impressive 3.17 ERA. In training camp in 1952, Foytack was a surprise “spring sensation.”8 He came north with the Tigers, but was sent to Triple-A Buffalo before the season started. In Buffalo one scout called him “the hardest throwing right hander in the league.”9 That season he bounced between Buffalo and Williamsport with a combined 8-10 record. In 1953 Foytack made it to the majors. He started the season on a roster that included his boyhood hero, Hal Newhouser. He made his big-league debut on April 21, pitching a scoreless inning of relief against Chicago. After appearing in six games and giving up 12 runs in 9.2 innings without a decision, he was sent back to Buffalo. There he had another good season with a record of 13-10. Buffalo manager Jack Tighe called him “the best pitcher in the International League.”10 Paul demonstrated his resiliency when his parents came from Scranton to see him pitch. Against Rochester on July 19, he lasted only three innings in a loss; but on July 21, with only one day of rest, he beat Ottawa 4-3. The next spring Foytack again failed to stay with Detroit. “We didn’t get moved up like they do now, ‘cause there were so many farm teams and so many players.”11 That season he struggled in Triple A. He split his time between Buffalo and Louisville, finishing with a combined 5-10 and 5.33 ERA. Foytack finished the 1956 season with a 15-13 record and 3.59 ERA. His 184 strikeouts were the third best in the league. He also finished in the top ten in games started, innings pitched, and complete games. But Foytack also earned the dubious distinction of topping the league with 142 walks, a team record at the time. Additionally, he began to get a reputation for serving up tape- measure home runs. Paul ranked fifth with 24 homers allowed. On June 13, Mickey Mantle blasted one of Paul’s fastballs out of Briggs Stadium. In early 1958 Tigers general manager John McHale expressed excitement regarding Paul’s potential. “Foytack has the potential to become a 30-game winner. He has a rubber arm and an effortless delivery.”21 Nevertheless, Paul’s spring training was a disaster. Jack Tighe lamented that he “was the worst pitcher in our entire organization this spring.”22 Paul then bewildered his manager in his first two regular-season starts, both complete-game six-hitters with only two earned runs allowed. On May 31, Foytack hurled a complete-game shutout against Chicago, bringing his ERA down to 2.62 and his record up to 5-4. Then his fortunes turned around in his next ten starts. His ERA climbed to 4.59 as he won two and lost five. Bill Norman replaced Tighe as Detroit’s manager in early June. After Paul lasted only 2 1/3 innings in a 3-13 loss to the Yankees on July 22, Norman assigned him to the bullpen. Foytack’s strong finish in 1958 further raised the expectations of Tigers management. Instead, the start of 1959 campaign was another disappointment. Paul failed to go the distance in his first ten starts, compiling a 2-6 record with an 8.06 ERA. Desperate to turn things around, Foytack tried losing weight. “What the heck, if I don’t start winning, I’m not going to be eating anyway. What have I to lose?”27 Again facing banishment to the bullpen, he finally righted himself with a complete-game five-hit 3-1 victory over Cleveland on June 1. This was the start of a 12-8 run to finish the season 14 -14 with a 4.64 ERA. Foytack’s gopher-ball reputation continued to grow. He served up a career-high 34 round-trippers, including a tape-measure 485-foot blast by Harmon Killebrew on June 19, 1959. After four good years, Foytack’s 1960 season marked a turning point in his career. A residual shoulder problem from the prior year returned in spring training and worsened. “I tore muscles in the front of my shoulder, under my arm down to the elbow.”29 He split time between starting, relief and the disabled list. Paul pitched only 96 2/3 innings in 28 games, 13 as a starter and 15 in relief. He finished with a 2-11 record and a 6.14 ERA. Foytack later observed that he struggled to throw as hard after this injury and was never the same pitcher. In his last appearance as a starter on September 10, Paul yielded another legendary Mickey Mantle home run. In the seventh inning, Mantle blasted a 2-0 fastball that cleared Briggs Stadium’s right-field roof and landed in Brooks Lumber yard across Trumbull Avenue from the stadium. The drive was estimated to have traveled 643 feet. Foytack had worked hard in the offseason to strengthen his arm through weight training. Early in the season Paul was seldom called upon to pitch. Frustrated with the inactivity, he cracked, “Twenty more minutes of pitching batting practice and I will earn my letter.”31 His first appearance of the season, as a reliever on April 26, was memorable. In the fifth inning Roger Maris hit the first of his record breaking 61 home runs off Foytack. Few would later recall that it took Maris eleven games to begin his epic pursuit of Ruth’s HR record. Early on Paul struggled, giving up several long home runs. At the end of May he had a 2-3 record with a 6.13 ERA. But then he turned things around to become a key contributor to the Tigers’ strong season, finishing with an 11-10 record, 169 innings pitched and a 3.93 ERA. On Aug 31 he went 9 innings in an 8-2 victory over Chicago to pull the Tigers within 1½ games of the Yankees as they went into New York for a weekend series. But the Yankees swept Detroit that weekend, the team faded in September and finished second even though it won 101 games. During the 1961 off season, Foytack became the subject of trade rumors.32 Nonetheless, at the start of the 1962 season he was still a Tiger and became the team’s longest tenured player.33 However, he now found himself in the bullpen. Ineffective in his first two relief appearances, Paul was inserted as a starter on May 6 to replace the injured Frank Lary. Taking advantage of this opportunity, Foytack surged to a 7-1 record by early July. This stretch included one victory as a starter on two day’s rest. No longer able to rely on an explosive fastball, Foytack, pitching coach Tom Ferrick observed, “has become a pitcher rather than a thrower.”34 His won/lost record faded as the season went on, but Paul finished the season at a very respectable 10-7 with a 4.39 ERA. Again there were offseason trade rumors. However, Foytack was still with Detroit on opening day in 1963. Relegated to the bullpen and not pitching in the first 13 games, Foytack exploded in frustration on April 24. He left the park in the eighth inning of a game without permission. He was fined $500 and told the press, “I was ready to pitch and they didn’t use me. I guess it finally got to me.”35 Paul apologized to manager Bob Scheffing and made his first appearance as a reliever the next day. Foytack pitched for Detroit in only eight more games. A trade to Boston fell through. On June 12 Paul made his last appearance as a Tiger, pitching one-third of an inning, allowing three runs and raising his ERA to 8.66. On June 15 he and Frank Kostro were traded to the Angels for George Thomas and cash. Entering the 1964 season there was speculation that Foytack would contend for a spot in the Angels’ rotation. Instead, he made only two unsuccessful relief appearances and was released on May 15. Foytack was picked up by his old team, the Tigers, playing for the AAA Syracuse Chiefs. He appeared in 30 games, posting a 10-10 record and 4.53 ERA. In 1965, Foytack gave it one last try with the Chunichi Dragons of the Japanese Central League. His reaction to baseball in Japan was not totally favorable. He found Japanese playing tactics to be “completely different than in the states. I think they’re pretty crazy.”39 Nevertheless, with great pleasure, Paul later recalled using his changeup to record easy outs against Japan’s legendary home-run hitter, Sadaharu Oh.40 Foytack finished that season with a 3.14 ERA in 57 innings pitched. Shannon, Mike, Tales from the Ballpark, Chicago: Contemporary Books, 1999. “25,158 at Mexico City See Coast Squad Win Star Tilt,” The Sporting News, January 4, 1956. “Buffalo,” The Sporting News, August 6, 1952. Biederman, Les, “Buc Fans Push Rumor Button -- Demand Swaps,” The Sporting News, November 29, 1961. Buncher, Ryan, “Area Rich in Minor League Baseball History,” Pittsburgh Tribune, July 21, 2002. Devine, Tommy, “Can’t You Figure Out Foytack,” Detroit Free Press, June 28, 1962. Falls, Joe, “Foytack Comes Back (As an Angel Starter),” Baseball Hall of Fame clip file. "Foytack Blows Fuse After Kayo -- Bounces Back as Tiger Whiz,” The Sporting News, August 26, 1959. “Foytack Gets Rude Welcome,” The Sporting News, May 16, 1951. “Foytack Handed $500 Fine for Going AWOL From Park," The Sporting News, May 18, 1963. “Foytack on the Track With a Quicker Curve,” The Sporting News, April 6, 1955. “Foytack Shows Hitters How It’s Done With Five in Row,” The Sporting News, June 5, 1957. “Foytack Stops Home-Towners.” The Sporting News, July 11, 1951. Kelley, Brent, “An SCD Interview with Paul Foytack,” Sports Collectors Digest, June 14, 1991. Kritzer, Cy, “‘Best Pitcher Int,’ Tighe’s Tag on Foytack,” The Sporting News, September 9, 1953. Marazzi, Rick, “Colorful Foytack experienced the good, bad and ugly,” Sports Collectors Digest, December 21, 2007. Middlesworth, Hal, Detroit Free Press, May 23, 1959. Middlesworth, Hal, “The Flipper is Back -- Watch Tigers Go,” Detroit Free Press, June 22, 1957. Ruhl, Oscar, “From the Ruhl Book,” The Sporting News, July 3, 1957. Spoelstra, Watson, “Bengals Find Another Starter In Foytack, Forgotten Man of ’55,” The Sporting News, May 30, 1956. Spoelstra, Watson, “Bengals’ Chances to Turn on Early Returns from Hal,” The Sporting News, April 23, 1952. Spoelstra, Watson, “Crystal-Gazer Cash Sizes Up Tigers As ’62 Flag Contender,” The Sporting News, December 20, 1961. Spoelstra, Watson, “Flossy ERA Figure Backs Bengal Faith in Foytack,” The Sporting News, January 1, 1958. Spoelstra, Watson, “Foytack Wins Big Place in Bengals’ Future Book,” The Sporting News, August 8, 1956. Spoelstra, Watson, “Hex--Waves Magic Wing as Yanks Wilt,” The Sporting News, May 3, 1961. Spoelstra, Watson, “Hudlin’s Coaching Straightens Out Tigers’ Curving,” The Sporting News, May 15, 1957. Spoelstra, Watson, “Tigers Flash Toothy Grin for Sad Sam’s New Secret Weapon,” The Sporting News, July 14, 1962. “Tigers Fix Flaw Finding Faultless Form for Foytack,” The Sporting News, September 17, 1958. Baseball Hall of Fame clip file, Paul Foytack. Nechal, Jerry, Interview with Paul Foytack, 2014. 1. Mike Shannon, Tales from the Ballpark (Chicago: Contemporary Books, 1999), 69. 2. Brent Kelley, “An SCD Interview with Paul Foytack,” Sports Collectors Digest, June 14, 1991, 152. 3. Rich Marazzi, “Colorful Foytack experienced the good, bad and ugly,” Sports Collectors Digest, December 21, 2007. 5. Ryan Buncher, “Area Rich in Minor League Baseball History,” Pittsburgh Tribune, July 21, 2002. 6. “Foytack Gets Rude Welcome,” The Sporting News, May 16, 1951, 31. 7. “Foytack Stops Home-Towners.” The Sporting News, July 11, 1951, 52. 8. Watson Spoelstra, “Bengals’ Chances to Turn on Early Returns from Hal,” The Sporting News, April 23, 1952, p. 13. 9. “Buffalo,” The Sporting News, August 6, 1952, 28. 10. Cy Kritzer, “’Best Pitcher Int,’ Tighe’s Tag on Foytack,” The Sporting News, September 9, 1953, 27. 12. “Foytack on the Track With a Quicker Curve,” The Sporting News, April 6, 1955, 15. 13. “25,158 at Mexico City See Coast Squad Win Star Tilt,” The Sporting News, January 4, 1956. 14. Watson Spoelstra, “Bengals Find Another Starter In Foytack, Forgotten Man of ’55,” The Sporting News, May 30, 1956, 10. 15. Watson Spoelstra, “Foytack Wins Big Place in Bengals’ Future Book,” The Sporting News, August 8, 1956, 11. 17. Hal Middlesworth, “The Flipper is Back -- Watch Tigers Go,” Detroit Free Press, June 22, 1957. 18. Watson Spoelstra, “Hudlin’s Coaching Straightens Out Tigers’ Curving,” The Sporting News, May 15, 1957, 10. 19. “Foytack Shows Hitters How It’s Done With Five in Row,” The Sporting News, June 5, 1957, 19. 20. Oscar Ruhl, “From the Ruhl Book,” The Sporting News, July 3, 1957, 21. 21. Watson Spoelstra, “Flossy ERA Figure Backs Bengal Faith in Foytack,” The Sporting News, January 1, 1958, 21. 22. Tommy Devine, “Can’t You Figure Out Foytack,” Detroit Free Press, June 28, 1962. 25. “Tigers Fix Flaw Finding Faultless Form for Foytack,” The Sporting News, September 17, 1958, 27. 26. Jerry Nechal, telephone interview with Paul Foytack, August 21, 2014. 27. Hal Middlesworth, Detroit Free Press, May 23, 1959. 28. Foytack Blows Fuse After Kayo -- Bounces Back as Tiger Whiz,” The Sporting News, August 26, 1959, 10. 30. Jerry Nechal, telephone interview with Paul Foytack, August 21, 2014. 31. Watson Spoelstra, “Hex--Waves Magic Wing as Yanks Wilt,” The Sporting News, May 3, 1961, 4. 32. Les Biederman, “Buc Fans Push Rumor Button -- Demand Swaps,” The Sporting News, November 29, 1961, 39. 33. Watson Spoelstra, “Crystal-Gazer Cash Sizes Up Tigers As ’62 Flag Contender,” The Sporting News, December 20, 1961, 21. 34. Watson Spoelstra, “Tigers Flash Toothy Grin for Sad Sam’s New Secret Weapon,” The Sporting News, July 14, 1962, 11. 35. “Foytack Handed $500 Fine for Going AWOL From Park,” The Sporting News, May 18, 1963, 10. 36. Joe Falls, “Foytack Comes Back (As an Angel Starter),” Baseball Hall of Fame clip file. 38. Jerry Nechal, telephone interview with Paul Foytack, August 21, 2014. 39. Baseball Hall of Fame Clip File. 40. Jerry Nechal, telephone interview with Paul Foytack, August 21, 2014.